Beach trips are always a welcome treat to recharge the soul, aren’t they? 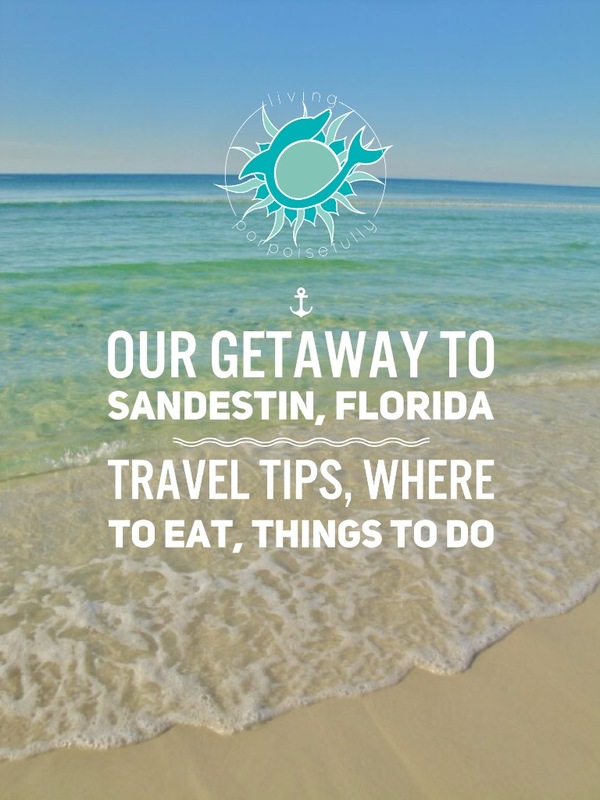 Sandestin, Florida fills this intent perfectly — so here’s our trip experience and travel tips so you can plan your own getaway. We got to enjoy a trip to the beach this past weekend (in Sandestin, Florida), and it truly was a much needed time of rest. Whenever we get the chance to go to the beach, it’s always a welcome treat to recharge the soul. Perfect weather, clear teal waters, and soft white sand made for a trip that gave us the recharge we didn’t know we needed! First off, our sea therapy started with a greeting from the Gulf Coast aqua waters peeking out from behind the boardwalk. It’s like an old friend waving hello from a distance! Therapy continues with a foot massage from the sand. I forget how good the sand feels to the feet, and Sandestin didn’t disappoint. It’s a luxuriously soft white sand, cool to the touch, especially on a 75 degree fall day. Even in the summer, the sand here stays much cooler than other kinds of sand. The sand grains in Sandestin are clear and white quartz grains that come from the Appalachian Mountains! There’s something about the walk down the beach that takes the blood pressure down. Is it the feel of the sand? Or the panoramic view of the aqua water kissing the shore? Let’s go with both. The feet get a little more TLC that only the seawater and sea foam can offer! Now that we’ve quickly gotten reacquainted with our old friend the sea, it’s time for some exploring. As a Marine Bio teacher, it’s a must to see what treasures the ocean has brought us! Sandestin didn’t disappoint for options to eat and shop either! Outlet shops, beautiful outdoor malls, and beachy boutiques in various locations should have all of your shopping needs covered! We found great places to eat for lunch, including one of our favorite sustainable seafood places, Tommy Bahama Café. The Marina Bar and Grill gave us beautiful views of a calm bay and the marina, and we ended up eating there for lunch one day and dinner another! Grimaldi’s Brick Oven Pizza cured our craving for pizza and house salad. There was a grocery store near the shops and our hotel, so we ate dinner in our room a couple nights with the groceries we bought. Tip: We find that eating a small breakfast in (fruit, nut bars), a big lunch out, and a small-to-medium dinner (out or in) does the trick for helping to balance our stuffed-ness, both in our bellies and our wallets! For fun things to do outdoors, there were all sorts of options: fishing, golf, kayaking, standup paddleboards, and of course, playing in the sand and sea. We loved how family-friendly it was and that there were plenty of outdoor activities to do. Tip: For the least amount of crowds, schedule your beach time in the morning (the earlier the better) or late afternoon. We also were sure to take time to be lazy in our room and be true to the restful getaway we needed by napping to our heart’s desire! We hope our getaway brought you a mini-escape, gives you a taste of Sandestin, and encourages you to take time to recharge however you can. We definitely recommend it as a destination, and October was an unbelievable time to visit weather-wise (and of course to make a sand Jack-o’-lantern!). So take time to recharge and soak in all that the beach has to offer whenever you can visit! what property do you recommend viewing in the area of Sandestin?